There are a variety of waterfall hikes in Virginia’s Blue Ridge Mountains that highlight the outdoor beauty of our region. Getting a chance to walk along a meandering stream or stand at the base of a roaring waterfall is a great opportunity to connect with nature, and you’re also likely to stumble upon a few unforgettable views. The changes in elevation in the Roanoke Valley in Virginia’s Blue Ridge result in numerous trails that follow creeks and streams that cascade over rocks and logs and often lead to a payoff view of a waterfall. For an easy, family-friendly hike, Cascade Falls and Roaring Run Falls are two popular options that also serve as great spots for a picnic. For more of a challenge, consider the climb at Apple Orchard Falls or Bottom Creek Gorge, which are both located near the Blue Ridge Parkway. The experience of hiking to a waterfall in Virginia’s Blue Ridge is different depending on the time of year you plan your adventure. An autumn visit includes walking under a canopy of a gorgeous fall colors, while a winter trek could provide the opportunity to see stunning ice formations along the water. A spring hike will likely feature beautiful blooms and a summer trip means taking advantage of the nearby water to keep cool. No matter what time of year you plan your hiking adventure, you’ll be surrounded by the beauty of Virginia’s Blue Ridge Mountains. Below is a list of waterfall hikes in Virginia’s Blue Ridge. 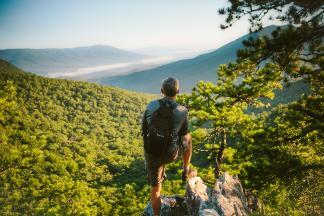 Don’t forget to also refer to our list of Hiking Tips and, if you’re interested in more hiking options, check out the Virginia Triple Crown. 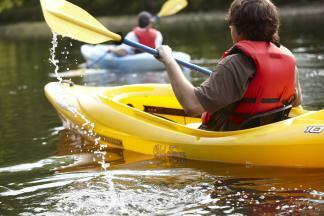 Jump right in the water or paddle your way through Virginia's Blue Ridge.